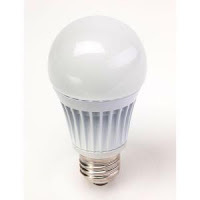 Based on the responses from the giveaway entries filled out over the last week regarding your experiences with compact fluorescent light bulbs, it seems like there is a lot of satisfaction with these bulbs, mixed with worry over the mercury in them. There was also a lot of dissatisfaction based on how long they lasted, how long it took for them to "light" up and what kind of light they put out. So, I'm excited to announce the winners of the LED light bulb giveaway sponsored by Home Depot because it's great to share some new technology that many of you may otherwise not try. All right all you fantabulous winners! You can thank the random integer generator gods. Send your contact info to crunchychickenblog@gmail.com and I'll have Home Depot send your spoils your way. Congratulations!!!! Wow... I think that is the fastest I've ever ran across the house. I won? I won?!? Thank you so much, "Deanna and the Random Numbers"!